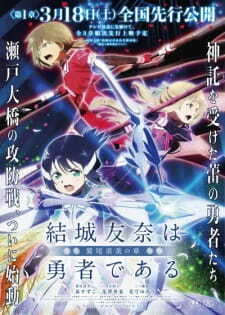 “Yuki Yuuna wa Yuusha de Aru Washio Sumi no Shou Movie One” is the first of three movies and functions as a prequel to the original TV series that aired in 2014. This movie triad depicts the story of the team of three heroes that came prior to Yuuki Yuuna’s team. Their team was also briefly mentioned in the TV series, and served the purpose of informing Yuuki Yuuna’s team of the dangers of being a hero and the consequences that those powers have on them. This movie should only be watched after you watch the original TV series, but it can function on its own without the original TV series. The story primarily follows the team of former hero leader Sonoko Nogi, who ended up losing her limbs as a result of what we are are now able to witness through these movies. You should go into this movie expecting it to primarily consist of character development with a few action scenes as they fight off their otherworldly invaders. There is very little world building in this movie, but this movie offsets this by focusing more on the aspects of the heroes, their relationships with each other, and the battles that they have to fight. The main characters in this series are all girls in sixth grade and are relatively archetypal in the sense that I could name numerous characters that are similar to each one. However, I could easily see myself giving this category a seven out of ten. Sonoki Nogi, the current leader, comes across as a loving, kind, and fluffy character. She’s very laidback and you can often catch her dozing off and sleeping, but don’t be fooled by her casually lazy appearance. Despite coming across as ditzy, she’s a surprisingly perceptive girl, who can even answer classroom questions right out of her sleep. She is a very dependable, spear-wielding, tank-like character in battle, and she is chosen as team leader for her quick thinking in emergency situations. The last main character is Gin Minowa. She is a tomboyish character, who often arrives to school late. In most cliche series, she probably would have been the main character and leader due to her fierce combat style and genuine kindness towards her family members and strangers. Like Nogi Sonoki, she is also a laid back character who is pretty outgoing, but rather than being ditzy, she’s more of a hotheaded but reliable girl in general. She wields two large twin swords to block and crush her enemies. The art in the series is pretty good. The frame rate for the movie outside of the fight scenes is relatively low, so you may be able to see a bit of awkward movement. The art is also not interesting or profound in any way, but the alternate dimension where they go to fight does have a good amount of visual appeal to it. The fight scenes have a pretty good amount of detail and special effects, where the 3DCGs blend pretty well and the animations are very fluid. The transformation sequences also have a good amount of detail to them, but I’m not sure how I feel about the several brief loli fanservice scenes. Overall, I’d give this category an eight out of ten. The art is pretty good overall, but it’s actually exceeded by the music/sound category in this anime. Created by the composer of the soundtracks in the Nier Automata game, the OSTs from this series are unsurprisingly great, very impactful, and enhance the movie’s imagery as well as the impact of the story. I really enjoyed the OSTs in this movie; enough to give them a nine out of ten. The OP and ED were both pretty good. Some of the OSTs felt like they received some inspiration from Yuki Kajiura; the composer used some characteristic chord progressions and sounds that she commonly uses. I felt the transformation sequence's OST could have used more bass in it, but the OSTs were all pretty high quality other than that. The characters’ VAs all did a pretty good job on each of their characters as well. To denigrate every new magical girl dark twist anime into just a diminished copy of Madoka Magica is a truly biased and unfair thing to do. And yet, too often do we see this mistaken judgement of any anime that is even remotely similar to Madoka Magica. This is especially unfair because Madoka Magica was made by shaft, an extremely wealthy studio, and is generally considered to be one of the pinnacles of the magical girl genre. The Yuuki Yuuna wa Yuusha de Aru franchise is not Madoka Magica, nor does it intend to be. You may enjoy it if you enjoyed Madoka Magica, but don’t expect it to be exactly on the same level. I enjoyed this movie, and would definitely recommend this movie series to you if you enjoyed the TV series or other magical girl dark twist anime. Ok, so a bit of a disclaimer. Though this is a prequel to "Yuuki Yuuna wa Yuusha de Aru" the TV series (Will refer to it as YuYuYu from now on), WATCH THAT FIRST! This story contains a few low level spoilers and one HUGE spoiler for YuYuYu. This review will also contain those spoilers in them, as they are not spoilers for this movie. HUGE TL;DR: If you liked YuYuYu you will probably like this too. First off, before I begin, just like in YuYuYu, pay attention to the little details. This series loves doing that, putting character development in those little things. To give an example, because if you're here you better have watched YuYuYu. When Yuuna first enters Jukai, when she clenches her fist, it's shaking. In the car, I can't remember the episode or circumstance offhand, she was also shaking when hugging Tougou. These kind of things, in these examples display that Yuuna isn't quite as courageous as she may appear, but faces her fears for the sake of her friends. Those kind of things are present here as well. With that out of the way, let's begin, shall we? Let's start off with the story, I gave it a 7. This is me judging it less as a stand alone picture, and more as part of a whole; like if I was judging the story of an anime at episode 4/12. Leniency is provided, it mostly set up the story and gave a little bit of insight into the characters. Hopefully, just like YuYuYu it will deepen later. This story takes place 2 years before YuYuYu. To put it in the simplest terms, 3 girls chosen to be heroes and protect the world from these "Vertexes." Same deal as YuYuYu, just with a smaller cast. The story mainly revolves around Washio Sumi, better known as Tougou Mimori, with the the other 2 girls being main, but less main. The art. OH THE ART! I am a HUUUUGE fan of the art in YuYuYu, and this one delivered in full, and even added a bit more too! Jukai retains its normal look, but a bit more with it has been added for effect. For example, when the characters jump, they leave behind pedals of their thematic flower. The corruption to Jukai seems to burn and rot instead of just rotting. Little things like that. The movie still retains the beautiful and mystical look in everything relating to Jukai. The weapons that the heroes use look as cool as ever, and have a bit of added effect to them as well. All that, and the animation is super fluid. I could go on for hours about this, but I'll spare you. The music delivers on all the same fronts, though there was one song that felt a bit out of place. Only thing preventing me rating it a 10 is that one placement, and that they ru-used a lot of music from YuYuYu. The sound effects are good like usual, they sound right. Again, leniency provided here. The characters, just like at the beginning of YuYuYu are kind of stale, but we do get a bit of insight into them on a deeper level here. Heres hoping that the other movies will develop on the level YuYuYu did, or at least somewhere near there. They are not the most interesting, but they are more than just 1 characteristic, and are not super boring either. I rather enjoyed it, there was nothing super feelsy or anything, knowing this series probably something will be down the road. It was funny cute and over all was just a good time. I'm gonna be honest here, I would have given this an 8 if not that I knew there was more to come. The entire movie is really well put together and sets the premise very very well, but it does not do much more than that. And that is really where my main problem with it stems, but that is honestly just because I want more and I want it now more than anything else. But yeah, it was fun and it was nice! I had thought that the Washio Sumi arc would be best suited to a TV anime (which they did do, and it only lasted half a cour), or perhaps an OVA. Maybe it was for the best that they released it as a film first, so that way the budget for visuals and sound, not to mention the schedule, wouldn't be as tight. I found it interesting that they opted for a trilogy of short films, but to be fair to the studio, they were released fairly quickly. This film, to abuse an opera reference, is the overture and opening act. We meet one familiar face under a different name, and two new faces. While this isn't the "Original Heroes" according to canon, it's a previous generation of Heroes that was referenced in YuYuYu. Unusual for a theatrical release, there's an opening theme song by Suzuko Mimori. Wow, her voice is pretty, and the refrain's haunting melody foreshadows what's ahead. But we're not beating up on Heroes this time around, at least, not while they're greenhorn rookies. The "boot camp" sequence felt a little long, but established the camaraderie and close bonds between the trio. Unfortunately, the characters are a bit of a weakness-- Sumi is the standard straight-laced hero, and Gin is your typical "nekketsu" hero. Quirky, oddball Sonoko steals the show for me. Granted, we're just starting to get to know them in this film, remember, it's the opening act. The films repeat the YuYuYu formula as before: a few close young friends thrust into intense, life-or-death battles. Only this time around, they're in grade 5 or 6 as opposed to middle school (7-9). Not as young as Nanoha (grade 3) when that series started, but... yeah. So I will say that my score of 6 is really because I didn't expect this to simply be the first part. I dunno, the ending really left me cold. I wanted more, but not because it was so good. This may have come from the fact that I knew a bit of the story already so had expectations that weren't met. One thing that I really did like about this movie was the character development. Especially for Washio (Tougou). I still want to know where exactly her nationalism came from since she's just as nationalistic as she was in YuYuYu. Like...did she learn something that sparked it, or was it something that came from the family she lives with? It's odd since literally no one else seems to feel the same way she does. Her relationship with Gin and Sonoko is great as well. I do like how she wasn't sure if she could trust those two, especially with the way they act. But through the course of the movie she see their strength and talent. It was a really nice touch and watching them blossom into real friends with them. I'm not an animation expert but I think the animation here is really well done. Maybe even a little bit better than the animation in YuYuYu, at least in the transformation sequences. I do hate the fanservice on these 12 AND 11 YEAR OLD GIRLS!! It bothered me a lot, but they don't transform all that much really. I'm still salty about it though. All in all very enjoyable and I'm glad I watched it. Minowa gin vs sonoko nogi who will win?